Service management is a must do initiative for a service organization, and a necessary transformational effort for any IT organization. The recent downturn in the economic climate has created the perfect conditions for a service management initiative to flourish based upon the original promise of improved quality and reducing costs. This presentation explores an alternate approach to the traditional approaches of ‘process improvement’ and progressive advances through ‘maturity levels, and one more suited to the economic conditions. 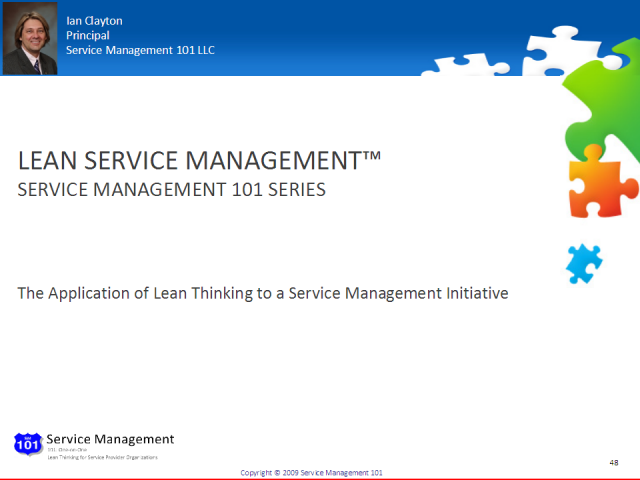 Instead of the adoption of an often onerous best practice framework, and the high-risk design, development and deployment of numerous policies, procedures and artifacts, a Lean Service Management™ program applies Lean Thinking to a service management initiative. Lean Thinking replaces a considerable upfront commitment of resources and expense with an unrelenting focus on the identification of waste of resources, and application of small incremental improvements as part of a continuous improvement program. All efforts are self-funding and consumer satisfaction is at the heart of every decision.